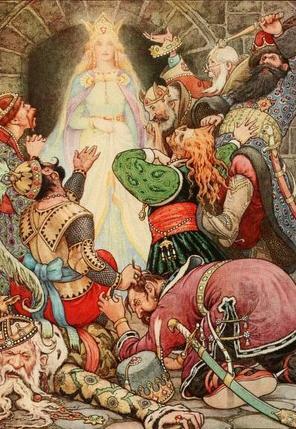 Read Russian fairy tales from The Russian Garland as well as from authors like Robert Nisbet Bain and Alexandar Afanasyev. View entire list of Russian fairy tales. About: Russian fairy tales are deeply rooted history in Slavic Mythology. They are vibrant, riveting and poetic tales of gods and demons, heroes and witches. Pagan slavic religion had deities for everything, such as water and household spirits; these stories for children taught people about manners, traditions, and warned against natural dangers. Russian fairy tales nearly saw their extinction in the wake of Soviet rule because communist proponents found folklore detrimental to furthering their ideals. However, a man, Maxim Gorky, stressed the importance and artistic value of the country’s folklore, and convinced Soviet leaders that fairy tales were, in fact, in line with communistic beliefs, and would help foster patriotism and support a burgeoning soviet society. Because of Gorky’s efforts, the 1920s are considered the Golden Age of Russian Folklore, as research and preservation efforts were expanded to increase the country’s collection of fairy tales and folk tales. Many new writers took the stage and wrote contemporary folklore that extolled political leaders, like Stalin and Lenin, and imparted communist ideals and morals. In this way, Russia’s folklore was not only a means to maintain tradition and impart values and morals to a community, but also a means of distributing soviet propaganda to the masses. Russian fairy tale heroes and Slavic gods continue to be depicted in the modern arts of Russia, and many holidays are held annually to celebrate their favorite heroes. Though Russia adopted Christianity in the 10th century, and tried to replace Slavic gods with Christian icons, the heroes of lore persisted and could never be entirely eradicated. Russia has such a wide and rich collection of folklore due largely to folklorist, Alexander Afanasyev, who published more than 600 Russian folk tales and fairy tales, and thanks to British scholar, Robert Steele, who gathered and anthologized numerous folk tales from the region into the fairy tale collection known as The Russian Garland.